Information about events I’m hosting. Events I attend are in the Life category. Hello! May I feed you some pie? Yes, it’s time for Pie Night again. 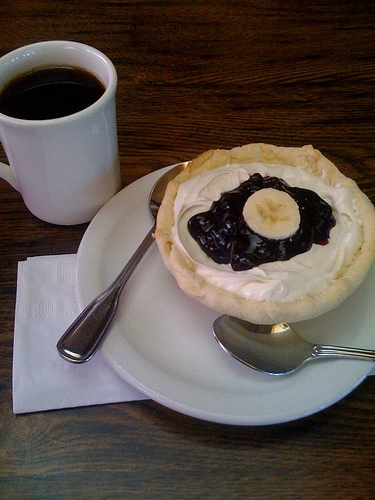 Come to Voxx Coffee on Eastlake Ave on May 7th at 7:30 p.m. for a pie extravaganza! The concept for Pie Night is simple. I make lots of pie (10 pies for the last pie night, plus another dozen brought by others) and people eat pie. There is no charge for Pie Night. Pie Night starts at 7:30 p.m. sharp and ends at 10:00 p.m. Please arrive promptly. I will not save pie for you. As noted, Pie Night itself is free. Beverages, including beer and wine, are available from Voxx Coffee for reasonable prices. Pie Night welcomes your pies if you have made them yourself; no store-purchased pies please. Pie accessories such as whipped or iced cream are welcome. Children are welcome so long as you don’t mind them listening to adult conversations. For those who have dietary restrictions, let me know when you R.S.V.P. so that I may accommodate you. I’m quite happy to make dairy-free and gluten-free pies and can likely deal with other issues as well. Please invite your friends or forward this invite. I started Pie Night to meet people! I do request R.S.V.P.s so that I can provide pie for everyone. 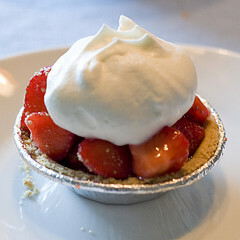 To R.S.V.P., comment on this post on my blog or LiveJournal, or add yourself to the Pie Night Facebook event. 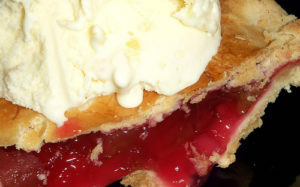 Posted on 08 Apr 2011 Author Philip WeissCategories EventsTags pie, pie nightLeave a comment on May I Pie? 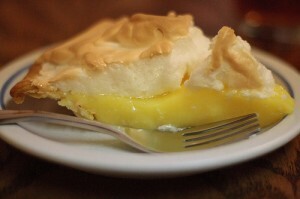 In lieu of regular content on this blog (for the moment), I give you a Pie Night announcement! The next Pie Night will be Saturday the 15th of January at 7:30 PM. What is Pie Night? Pie Night is where I make a lot of pie in a glorious attempt to buy friends. If I can be bribed by pie, I figure a lot of other people can be too. Feel free to bring your own pies (not store bought), though this is by no means required. The only requirement for attendance is that you eat pie! Please note the start time and the location! There are some changes this time around. Voxx Coffee (Facebook) has graciously agreed to provide the space free of charge. The start time is a little later than previous start times as well. We’ll have 2½ hours to consume pie. Please do not bring beverages. Voxx has beverages (including beer and wine) at reasonable prices. Please respond here or add yourself to the Pie Night Facebook event if you intend to come! Invite your friends too. It’s a bit shorter notice than previous incarnations, but here’s the official announcement/invite to the next Pie Night! It will be Friday, June 18th, running officially from 3 p.m. until whenever. Show up any time before the pie is consumed. Location will be my place; the pool if it’s sunny, inside if not. Take off from work early and enjoy a bit of sun and tasty pastries. Please state if you are planning to come and if you are bringing a pie in comments. What is Pie Night? Do you need to ask? It’s all about pie! I make pie. Other people make pie. People eat pie. You do not have to bring pie. You have to eat pie if you come. My address: 2301 Fairview Ave E, Seattle. Oh, and to answer the inevitable question: no I do not know what pies I will make. I never decide until a day or two before. Photo by Heather Katsoulis, used under a Creative Commons Attribution ShareAlike license. With all the hullaballoo in my family, I haven’t gotten around to posting this to the blog yet. Most everyone will have seen it on Facebook, though. Next Pie Night will be Sunday, January 17th, nominally from 4 pm until 11 pm. Do you like pie? Then come to pie night! Friends and enemies alike are welcome! You can bring a pie, but you don’t have to. If you do bring a pie, please make/assemble it yourself; purchasing a pie at Whole Foods is verboten. Feel free to bring beverages, whipped cream, ice cream, or other pie accoutrements. Where? 2301 Fairview Ave E in Seattle. Ring WEISS on the call board. Please note in the comments here or add yourself to the Easy as Pie Night Facebook event if you plan to come, and if you plan to bring pie. I need to know approximately how many pies to make. Any last minute questions or need of directions? Call 206-607-9177. Image A Slice of Lemon Meringue Pie by Daniel Greene used under a Creative Commons Attribution Non-Commercial No Derivatives 2.0 License. Posted on 04 Jan 2010 Author Philip WeissCategories EventsTags pie, pie nightLeave a comment on Easy as Pie Night! Pietoberfest, the next Pie Night is October 17th, officially from 4 p.m. to 11 p.m.
What is Pie Night? It is a celebration of pie! People come over, and then we eat pie. Sometimes before the sugar crash hits, we converse. There are fruit pies, cream pies, chocolate pies, and meat pies. There are all sorts of pies. This time I am going to post the rules in the the form of frequently asked questions, because people never seem to read them if they are rules. Do I have to bring pie? No. You do not have to bring a pie. I will make enough pie. Yes, you can bring pie. What about cookies? What about cake-pie? The concept is Pie Night. Every time there’s some joker who thinks it’s funny to ask these questions. It’s about as funny as Jay Leno. If you ask these questions I will revoke your license to breed. My pie didn’t turn out. I forgot. I ran out of time. What’s the nearest store so I can pick up a pie? The nearest store for approved Pie Night store-purchased pies is in Chaiten, Chile, which is currently evacuated due to volcano eruption. In other words, do not bring a pie from a store! This is to encourage people to attempt their own pies. If you don’t make a pie, just come and eat pie. Ice cream and beverages are always welcome, particularly alcoholic beverages. I do not drink, so you don’t want me picking out your alcohol. If you don’t mind your kids hearing ribald discussion, yes. Yes yes yes! Please let me know in the comments or on the Pietoberfest Facebook event if you intend to come, how many friends you plan to bring, and whether you intend to bring pie. I need to know how much pie to make. I don’t mind a few last minute additions or cancellations, but if I end up with 50 people when I expected 25, you may not get pie. My condo. It’s small but we’re all friends, right? 2301 Fairview Ave E. Ring WEISS on the call box out front. Image Long Slice of Pie Ala Mode 4 of 4 by cobalt123 used under a Creative Commons Attribution Non-Commercial 2.0 license. Posted on 03 Oct 2009 Author Philip WeissCategories EventsTags pie, pie nightLeave a comment on Pietoberfest! October 17th! Due to a scheduling conflict, the next Pie Night is postponed from October 3rd to October 17th. Repeat, do not show up at my place for Pie Night on October 3rd. I will not be here. Pietoberfest is now October 17th. Same bat time. Same bat place. Different bat day. Posted on 11 Sep 2009 Author Philip WeissCategories EventsTags pie, pie nightLeave a comment on Date change for Pietoberfest! Before I forget, the next Pie Night will be October 3rd. Save the date! Update: Due to a schedule conflict, Pie Night will be October 17th. Except it won’t be Pie Night. It’ll be Pietoberfest! Location: 2301 Fairview Ave E Apt 107, Seattle (my place). As always, all that’s required to attend is that you like pie. RSVP is requested, however so I can have a head count. Further promotional posts to follow. Posted on 03 Sep 2009 Author Philip WeissCategories EventsTags pie, pie night1 Comment on Pietoberfest is October 3rd! 2009 Walk to Defeat A.L.S. As most of my friends know, last October my mom died from Lou Gehrig’s disease, officially known as A.L.S. I moved to Bellingham for a year to help take care of her. A.L.S. is an ugly illness. While patients with A.L.S. don’t typically experience a lot of pain, they do lose independence and quality of life. Mom had to eat through a tube, wear a brace to hold her head up, and talk with a computer. I heard that computer so much the last year that I don’t remember much of mom’s actual voice. My part to see that as few people go through this as possible is to support the Evergreen Chapter of the A.L.S. Association. They fund research into A.L.S. and lobby on behalf of patients. For those who are afflicted, including mom, the A.L.S.A. was a lifeline of support. That computer? Provided by the A.L.S.A. Her hospital bed? Provided by the A.L.S.A. When the family first met with hospice, Mary from the A.L.S.A. was there. When mom saw specialists at Virginia Mason’s neurology center, Mary from the A.L.S.A. was there. The A.L.S.A. holds the 2009 Walk to Defeat A.L.S.A. in Bellingham in September. Until then, I’m going to write a lot about A.L.S. to educate and to get people to donate money. My family has a team, and I’ve set up a page for donations. If you donate money, I’ll give you a book. I need shelf space, so why not solve two problems at the same time. Books aren’t just the crappy books either: advance reading copies, autographed copies, hardcovers. Here’s the list of books. More information about mom, how to donate, and how to get your book at my walk page. Posted on 22 Jul 2009 Author Philip WeissCategories EventsLeave a comment on 2009 Walk to Defeat A.L.S. Saturday was Pie Night. It also was my birthday, though I didn’t post that. I haven’t been particularly enamored of making a big deal of my birthday for a few years. I’m not a particularly holiday-ish kind of person, and I only like being the center of attention in special circumstances. I scheduled Pie Night for my birthday mostly because it was a convenient weekend; the 4th would have sucked to host Pie Night. A few people noted it was my birthday and brought gifts, which was very thoughtful of them. Pies I made were a coconut pie, apple-cranberry pie, pear-ginger pie (with lots of fresh ginger), cherry pie, a pork-cranberry pie, and corn pie. All of them turned out to be tasty. I didn’t like the corn pie so much, but that was more that I like corn tasting somewhat different than it turned out. Ellen brought a raspberry custard pie. Mike made a key lime pie. And Carrie brought a crab pie and another savory pie, which I forget the contents of. Very tasty all of them. People who came by, that I remember: Erin, Walter, Ellen, Nisi, Jason, Kim, Mike, Allyson, Darren, Sara, Ron, Sara (a different Sara), Daidre, Keenan, Katie, Carrie, Amanda, Jeri, Gord, Chris, and Michael. Dawn and Manda didn’t make it but stopped by in the morning to hang out and help me clean up. I’ll post a couple of the pie recipes later. For those who are the type who need reminding, Pie Night is this Saturday at 5pm at my place, 2301 Fairview Ave E in Seattle. If you haven’t already committed to coming, now is the time. I do need to know an approximate head count so I can make enough pie. 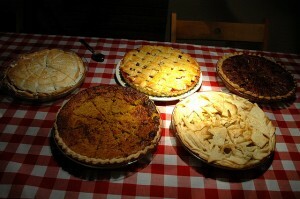 If the weather is nice, Pie Night will be held in the pool area overlooking Lake Union. You are welcome to take a dip if you are so inclined. If you are an alcohol imbibing type, bring something of that sort. Since I am a non-drinker, I hate to pick out the alcohol for the drinkers. Pie is welcome, but not required; I will make enough. Cake is not welcome. Posted on 07 Jul 2009 Author Philip WeissCategories EventsTags pie, pie nightLeave a comment on Pie Night Reminder!